Experimente o charme colonial espanhol de Antigua, Patrimônio Mundial da UNESCO, durante este passeio matinal de 5 horas da Cidade da Guatemala. Esta cidade atmosférica foi a capital do país por mais de 200 anos, criando uma riqueza de arquitetura histórica e belos cenários para você descobrir durante o seu passeio a pé. Pise nas ruas de paralelepípedos de Antigua enquanto você explora locais como a Catedral de Santiago, o Central Park e o Palácio dos Capitães Gerais. 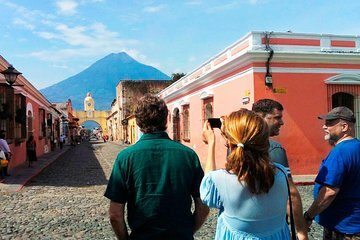 Sua visita a Antigua também inclui um guia e transporte de ida e volta ao hotel. Great walking tour and I got a chance to have a beer with and talk to an American expatriate... maybe a retirement possibility in Antigua! I loved this tour! Got my first Jade and had an amazing time with the Tour guide. The guide, Juan Pablo, had been my guide for a Guatemala City tour. His English is excellent, he speaks quickly and he volunteers tons of information. Some guides volunteer less and wait for you to ask questions. I did a 2nd tour to Antigua 2 days later with a different tour company arranged through our hotel and took my husband. That tour took us to a different Jade Museumthere's more than onejust FYI. The handicraft market is indoors. Some vendors speak English quite well. They may not negotiate down as much as at other markets i.e. Guate or Chichicastenango but the experience was pleasant. On Sunday there were more vendors at the market with their wares on blankets outside. Very disorganized, when the bus arrived to my hotel the tour guide has a different name on the ticket so I was at the lobby waiting to be picked up but they were asking for a different person. Thanks God I had all the information handy so we could check and surprise they were looking a different customer but it was me and my family.